...A Tidy Workspace Can Increase Productivity? Research in America by the quirkily named National Association of Professional Organisers (NAPO) found that executives across the Atlantic waste up to six weeks a year searching for lost items. Whilst things aren’t quite that bad in the UK, the survey also revealed that workplace clutter is destroying motivation so if we are to learn anything from it, then it’s time to get organised and have a tidy up! Plus, it’s not just staff feeling their feng-shui is being upset because everything from piles of paperwork through to dirty coffee cups can seriously damage a workplace’s image and deter potential clients. Thankfully NAPO says that simply reorganising a workspace and creating more efficient storage areas can increase productivity by 30%. They also revealed that 91% of workers feel they could be more efficient at work if they were better organised. Plus, cleaner work areas are more hygienic and easier to keep clean, so this can help to reduce the chance of infection and staff being off sick. The organisation also found a big frustration for staff is not having space or lockers to keep personal belongings such as coats, gym bags, pens and sandwich boxes. So, it seems there are major benefits to proactive employers encouraging employees to maintain tidy and organised work areas, because almost immediately they will see output improve. In addition, clearing things away after they have been used also makes for a much safer working environment. 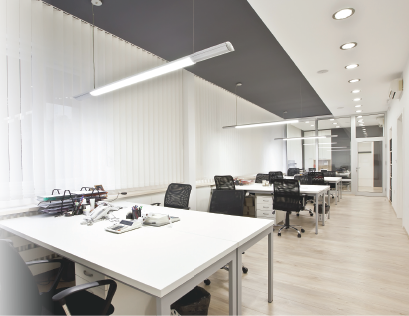 So the message is simple – a tidy workplace contributes towards a tidy profit! The office is often key to any business and whether it’s home to thousands of workers or used by one person for occasional administration, if it’s unorganised the repercussions will be felt throughout the organisation. Filing systems are obviously important and there’s a huge range of products available to help organise paperwork including secure filing cabinets, cupboards, shelf units and systems that can be integrated into individual desk layouts. Office machines and equipment that the whole team use should be placed in easily accessible parts of the office. These areas can also double as informal meeting areas with comfortable seating, notice boards and flipcharts to encourage people to share ideas. For many workers the office is their second-home and they spend most of their lives sitting in the same position in front of a computer screen. The Health and Safety (Display Screen Equipment) Regulations 1992 place obligations on employers to ensure employees are comfortable and safe in their daily tasks. We have a wide range of products to ensure employers adhere to these regulations and make the office a better place for employees. Desks and computers can cause a wide array of posture related problems and a poorly organised work station can result in huge amounts of unnatural pressure being placed on certain parts of the body. In a survey of The British Chiropractic Association’s members, 56% of chiropractors said office workers are most vulnerable to back pain and that sedentary PC posture causes more back problems than excessive lifting and carrying. This is backed up by research from Nuffield Health that found more than half of workers have suffered from back pain in the last 12 months. As a result ‘mouse shoulder’ is now a modern epidemic, which is caused by prolonged computer mouse usage, and lots of problems also arise from people cradling their telephone between their head and shoulder in order to keep their hands free. Few people realise the strain this puts on their neck, using a headset instead of a traditional telephone is the best way to break the habit and also helps you to sit up straight. Legislation is in place to encourage employers to take responsibility for the posture and workstation layout of employees. The Health and Safety (Display Screen Equipment) Regulations 1992 apply to all workplaces where people use computers and screens as a significant part of their work and they require employers to minimise risks by ensuring that work stations are well designed. Rather than listing specific requirements or equipment, the regulations require employers to carry out risk assessments on workstations and then address individual risks. Employers must consider the whole workstation including equipment, furniture, and the work environment as well as the job being done and the specific requirements of individual staff.